While superheroes and sequels will most likely dominate the summer movie season, there will still be a few original movies to enjoy during these sweltering months. 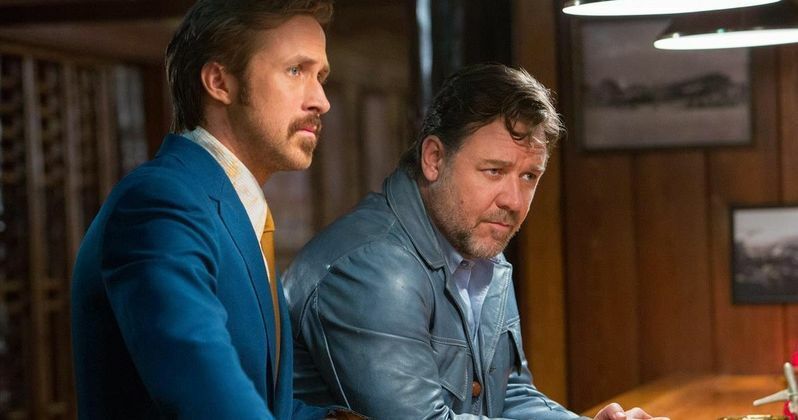 This May, for example, Russell Crowe and Ryan Gosling will team up for a new comedy entitled The Nice Guys, coming just two weeks after Captain America: Civil War and one week before X-Men: Apocalypse. To get fans ready for writer-director Shane Black's unique comedy, Warner Bros. has released a new trailer, following the red band footage released back in December. Shane Black directs from an original screenplay he wrote with Anthony Bagarozzi. Joel Silver is producing under his Silver Pictures banner, with Ken Kao of Waypoint Entertainment, Hal Sadoff, and Michael Malone serving as executive producers. This comedy adventure will be going up against two more high-profile movies, Sony Pictures Animation's The Angry Birds Movie and Universal's Neighbors 2: Sorority Rising, which will make for an interesting box office showdown this May. While The Nice Guys marks the first time Russell Crowe and Ryan Gosling have worked together, both are no stranger to Los Angeles period pieces. Russell Crowe played a 1950s L.A.P.D. cop in the 1998 classic L.A. Confidential, while Ryan Gosling played a 1940s L.A. police officer in 2013's Gangster Squad. We'll have to see how well this duo works together when The Nice Guys hits theaters in just two short months. The Nice Guys is Shane Black's third directorial outing, following 2005's Kiss Kiss, Bang Bang and 2010's Iron Man 3. He is also attached to direct a pair of highly-anticipated projects, Doc Savage and the Predator reboot. Take a look at the latest footage from The Nice Guys, to get ready for this summer comedy.